HINTS AND TIPS FOR A SUCCESSFUL SHOW! 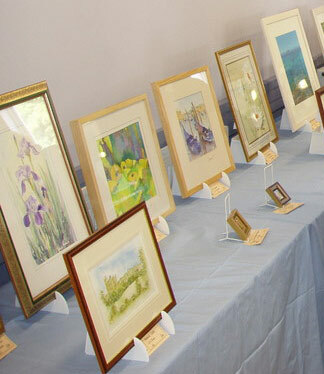 Many art Art Clubs do not have ready access to display screens and when do they either have storage or transport problems. One club member faced with this problem devised the Invisi lightweight display easel shown in use in this recent table top exhibition. 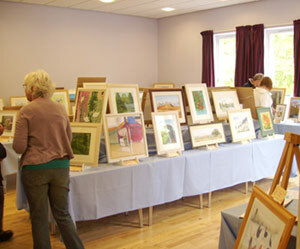 You have a venue, a local village hall, say, so this is one way of making a good show. Make sure you have enough tables and if a stage is available use that as well. Collect some cardboard Banana Boxes from your local supermarket they are rigid and the right height. Buy or source table cloths or table coverings, this display uses ex RAF duvet covers from an Army Surplus Store, split and hemmed. Cheap to buy, look good and they last! Lay out your tables making sure you do not block fire exits and ensure enough space for wheelchairs and viewing. Two tables side by side covered and then the boxes on top and covered again provides a two tier display area, round the room single tables and no boxes. It is useful if the cloths almost touch the floor as this provides a hiding place for the picture packaging and surplus kit. Simply snap your Invisi Easels together and place as required. Any free areas of space and extra large pictures can utilise members own painting easels and an area for these will usually be found. The relatively small investment in Invisi easels will be rewarded many,many times over. Tip:- always fold and store your Invisi Easels flat and in a box. They will last many years if cared for. Tip:- If using un-backed box canvases place a piece of card between the Easel and the Canvas to prevent indentations. Tip:- Stamp the Easels with your Clubs name as they are attractive and have been known to be desired by others. Invisi Easels are a copyright design and are available from Ken Bromley Art Supplies by Mail Order. Click Here.